For over twelve years, Affordable Elegance Bridal has been helping brides find the perfect accessories for their wedding day. Our owner and manager, Malinda, loved her face to face interaction with brides at the Affordable Elegance Bridal Boutique in Louisville, Ky. As a single mom, however, she found she needed more at-home time, so the Affordable Elegance Bridal website was born! Now exclusively online, she is able to work with brides world-wide to find their perfect bridal ensemble. She is eager to work with you as well! 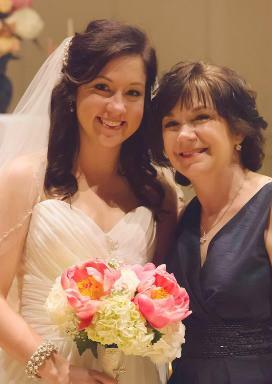 She has recently been joined by her newly married daughter, Lauren. Together they hope to provide you with a wonderful online shopping experience. At Affordable Elegance Bridal, we strive to feature products that reflect the latest wedding trends as well as classic bridal looks, offer quality accessories at affordable pricing, and provide the utmost in customer service. If you have questions or comments, please email us at malinda@affordableelegancebridal.com or call (502) 835-4421. Knowing that every bride wants to look and feel their best on their wedding day - and beyond! - we are excited to recommend the It Works! line of health and beauty aids! Questions? Call Lauren Crawford at 502-930-4138. Affordable Elegance has Low Prices on Bridal and Wedding Accessories Every day! Plus we offer FREE shipping within the contiguous U.S. and low International shipping rates. You'll find an extensive selection of bridal accessories including jewelry, tiaras, headbands, veils, and wraps for the bride. In addition, we have a large selection of accessories for your bridesmaids, the mother of the bride or groom, and for your prom or quinceanera. For decorating and accessorizing your ceremony and reception venue, we invite you to shop our elegant collection of candle lanterns and centerpieces, cake toppers, unity candles, favors and place card holders and more! We are excited to be an Authorized Retailer for Mariell, Elegance by Carbonneau, enVogue, Weddingstar, Kate Aspen, Fashioncraft, LC Bridal, Ansonia Bridal, Elena Designs, JL Johnson Bridals and Symphony Bridal. When you purchase from Affordable Elegance Bridal, you can be assured that the accessories you receive are authentic. Together with these designers, we bring you the very latest in bridal accessories. 1) Do you offer discounts for multiple purchases? Yes, we'd love to! Just ask! 2) When should I expect my order to be delivered? Orders within the U.S. are usually delivered within 7-10 days if the items are in stock. The exceptions to this are the custom made items. International orders are usually delivered within 7 -12 days by DHL. See our Shipping and Returns page for details. 3) I am in a hurry - can I rush my order? Yes, Please call at 502-835-4421 or email us with your wear date if you need your order in less than 10 days, and we'll be glad to work with you! There may be an additional fee for rush orders if expedited mail services are necessary to deliver your items by your wear date. 4) How much is your U.S. shipping? Shipping by USPS Priority Mail or UPS is FREE within the U.S. including APO and FPO addresses. Additional shipping fees are required for favors and place card holders, cake toppers, decorations and wedding accessory sets being shipped to Hawaii, Alaska and Puerto Rico. 5) Do you ship to APO and FPO Addresses? Yes, We'd love to! Shipping is FREE within the U.S. including APO and FPO addresses! Please note that customs, taxes and duties are not included in the shipping fee and are the responsibility of the International buyer. 7) Will my International Shipment be subject to Customs fees? Yes, For all buyers outside the U.S., all customs, taxes and duties are the responsibility of the International buyer. The purchase price is listed on the customs forms as the Item's Value. 8) Do you accept returns? Because bridal accessories are quite delicate, because our customers want to receive brand new (not handled) merchandise, and to keep our prices very low, we cannot accept returns or exchanges on any merchandise. All sales are final. Please refer to our Store Policies page for further information. 9) What type Payment do you accept? We accept all major credit cards and Paypal. 10) Can I read reviews from your customers? Sure! You can see our Customer Testimonials here! 11) Do you have active coupons I can use? Yes! You can use our coupon code "WB05" to take $5 off your order at anytime. Watch our newsletter and Facebook page for additional seasonal coupon offerings.